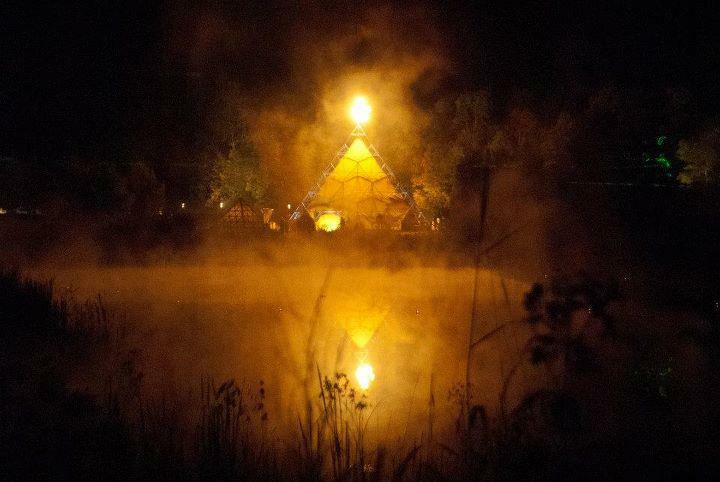 The good folks of the Harvest Festival have been dreaming of a new and improved central event structure for many years. Since 2005 there have been numerous designs, plans, models, and talks about bringing a new flagship structure to realization. 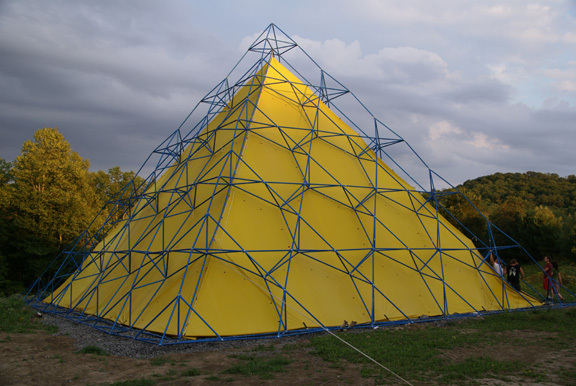 Late in 2010 the decision was made by Harvest to build a new pyramid. With a budget in place, some size and basic shape constraints, and a firm intention to proceed, Justin Martins (the principal organizer of Harvest Festival) brought in John Rose (of Rose Contract and Consulting Services) to revisit previous designs. With the growth of space requirements over the years the previous designs had became obsolete. This was due to the fact that scaling up these original complex designs lead to exponential growths in materials and manufacturing costs. 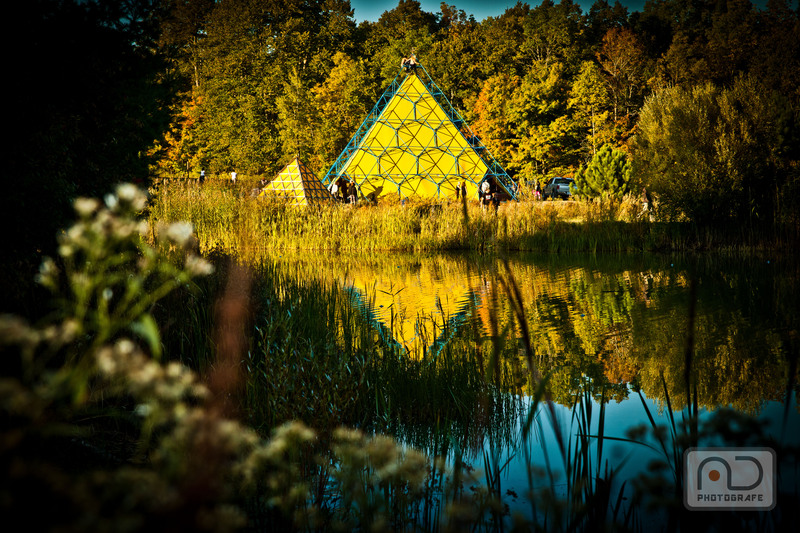 Given the immediate needs of Harvest Festival for a central artistic structure for its 2011 event and definite financial constraints, John set forth to develop a completely new design which would meet the refined design constraints and yield a unique and aesthetically pleasing structure. With some inspired ideas, and some intensive 3D modeling sessions, a model for the proposed structure was quickly produced. Within a matter of days a new design was imagined and brought to life. Following are few screen shots of the 3D model. The New design managed to meet all the requisite specifications, reduced the materials and manufacturing costs by roughly 2/3, and managed to increase the aesthetic appeal of the installation. In this instance less is more. Upon design review Justin and the rest of the Harvest crew were quite excited with the proposed design. At this point Justin and John finalized an agreement and decided to proceed with the development of this unique artistic structure. Continuing to work on a tremendously tight timeline, final adjustments were made to scale the structure slightly for materials optimization. Materials were researched, selected, and subsequently sourced. Connection designs were finalized and the manufacturing process was conceived. 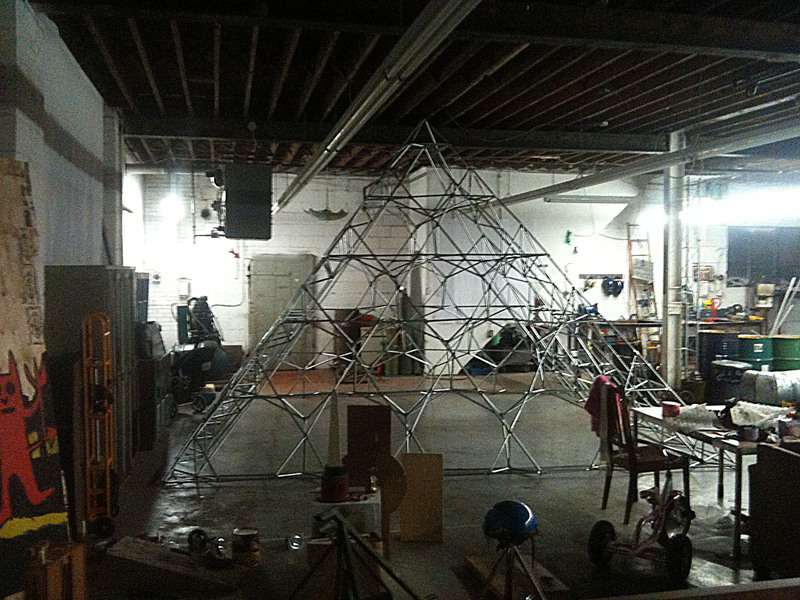 Arrangements were then made with Ted Redelmier to utilize the shop space at 91B in Toronto. A key part of the project was the importance of the personal community involvement in the development of the finished piece. For this reason and to assist with the budget constraints of the project an ad hoc temporary manufacturing facility was developed and built at 91B. One such “Laborers Favorite” tool from the manufacturing line was the manual compound press used to flatten the connection points of the 2 1/4″ tubular steel structural components. 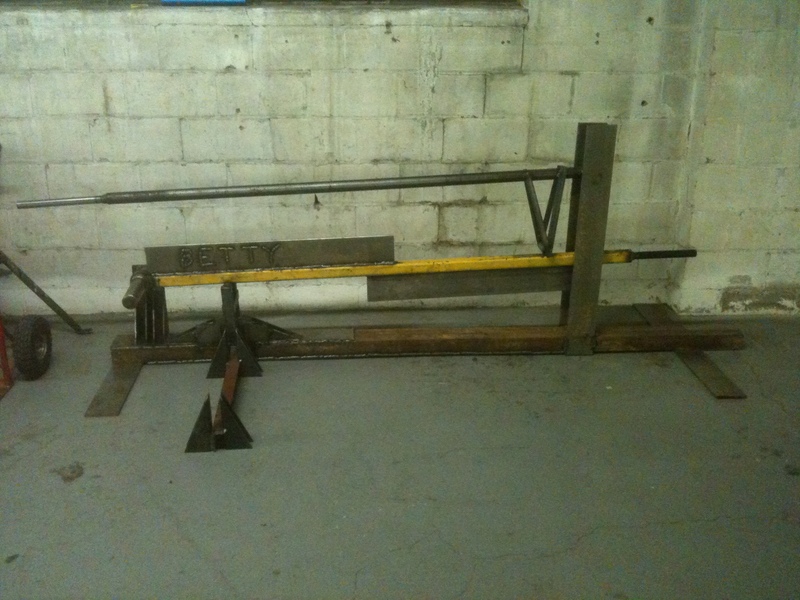 This press was so admired that it was eventually named and proudly branded “Betty”. After the manufacturing was completed most of the components built for manufacturing were returned to the scrap yard which the materials were sourced from. Betty however continues to be held in high regard and plans were laid for shipping her to the event for attendants to view. The newly built temporary manufacturing facility was staffed with volunteers from the Harvest Festival organizers and community. As part of the labor training and design verification process a 14.5′ tall scale model was manufactured and assembled at 91B. This preliminary process including roughly a dozen volunteers was completed in just a matter of a couple of days of actual manufacturing. After the initial training, and a brief wait for the arrival of materials, the manufacturing crew spent 3 days measuring, cutting, jigging and pressing, drilling, bending, cleaning, labeling, and packaging components to the design specifications set forth. 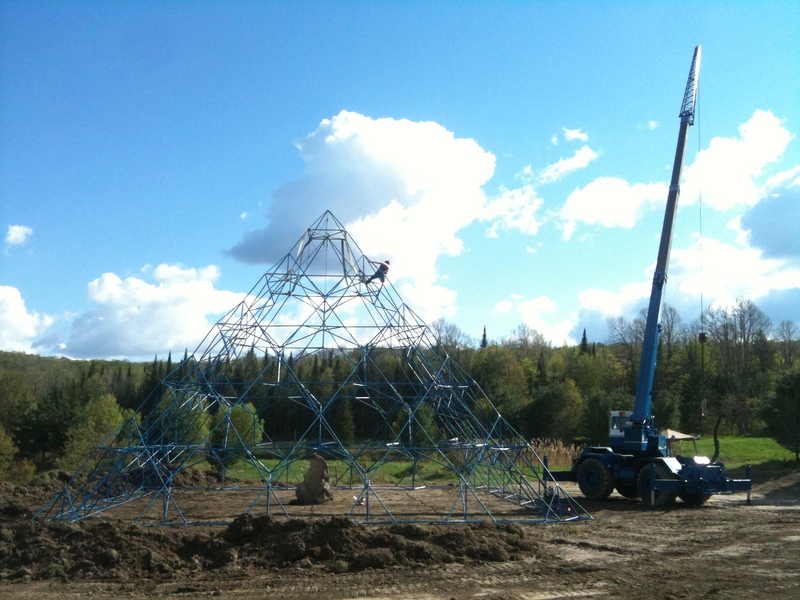 The components were manufactured on time and budget and shipped to the event site in preparation for spring 2011 erection. 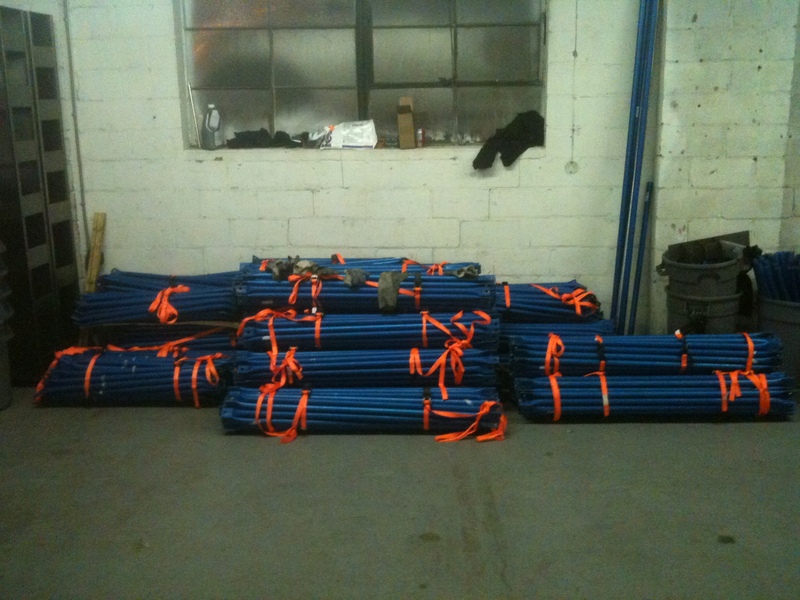 With the frame manufactured and shipped to the build site the crew took a much deserved break for the holiday season. During this time Justin sourced the materials and labor to fabricate the membrane while John Developed and finalized the basic Membrane Design. 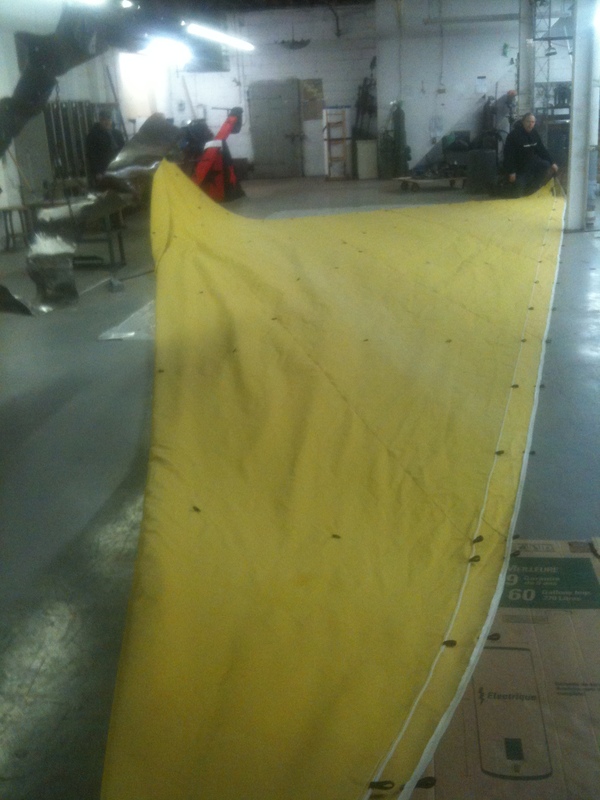 With only minimal oversight and the help of Guy Latulippe, Justin and the volunteer crew manufactured the roughly 10,500 ft^2 internal membrane based on the documented designs. For the spring of 2011 Justin worked with Peter Camini, the site owner, to coordinate the site preparation and acquisition of a 20 Ton crane for frame assembly. Utilizing many of the manufacturing workers the frame was assembled onsite. 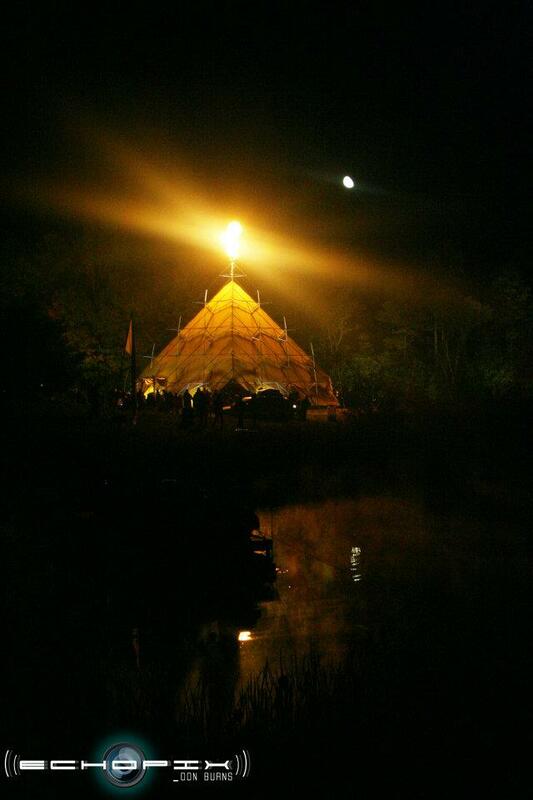 Thanks to the efficient efforts of all those involved the site assembly was completed ahead of schedule. Connection of all the components was accomplished in two full work days while node tensioning took place intermittently over the remainder of the installation week. 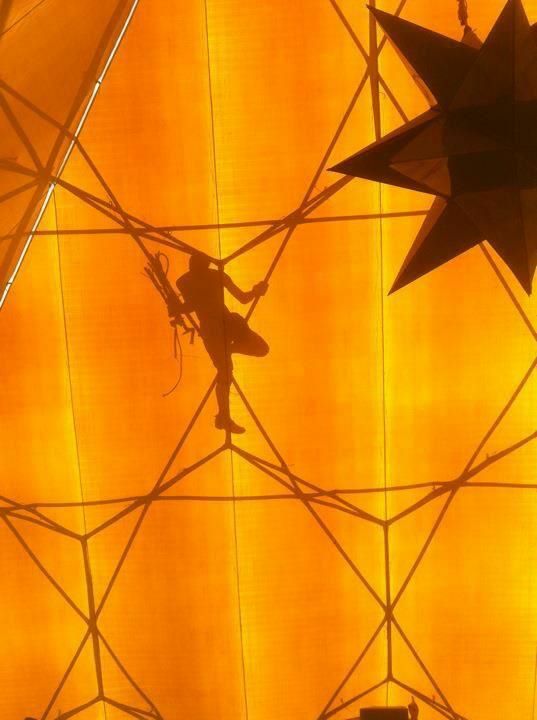 The Pyramid from seb grinham on Vimeo. Additional site work has continued post installation and will certainly continue until the surrounding vegetation is well established. All that is left now are some final touches and the official unveiling of the installation on September 16 2011. Well the dust has settled and the designs are brewing for the next, bigger, better piece. More to come soon but in the mean time enjoy a few pictures from out and about….